E&J Gallo is one of the most well-known brands within the wine category here in the UK, and you have no doubt come across one of its expressions over dinner, a gathering with friends or trying one of the many cocktail recipes they like to release to show off its versatility. But what do we actually know about the brand itself? Back on September 22nd 1933, brothers Ernest and Julio Gallo founded a winery at 11th and D streets in Modesto, California, and grew over the next 36 years to the point of recognition as the largest winery in the USA based on volume of sales. In the same year of 1966, they introduced their first range of sparkling wines, Eden Roc and André, which incidentally went on to become the largest selling brand in the USA. November 27th 1972 saw one of their biggest marketing recognitions as Ernest and Julio Gallo appeared on the cover of Time for an article titled “American Wine Comes of Age”, followed by the opening of their first International office in London and the release of their first vintage-dated wines, both in 1983. 1993 saw the introduction of the Gallo Estate Wines, but also the unfortunate passing of Julio Gallo at the age of 87. Before the turn of the century though, E&J Gallo was named “Winery of the Century” by the Los Angeles County Fair’s Wines of the America’s competition and “Best American Wine Producer” by the London-based International Wine and Spirits Competition in 2000. The acquisition of wineries and vineyards in Napa, Monterey and in the Central Coast over the next few years certified the continued growth of E&J Gallo, carrying on a tradition introduced with the first acquisition back in 1954 with the purchase of Cribari Winery in Fresno. In 2005, they became the first USA based winery to receive the International Standards Organization’s ISO 14001 certification, and purchased the popular Barefoot Cellars brand before the passing away of Ernest Gallo in 2007. The family still live on within the company as Ernest and Julio’s children, grandchildren and great-grandchildren have roles within, effectively becoming the world’s largest family owned winery and the largest exporter of California wine. 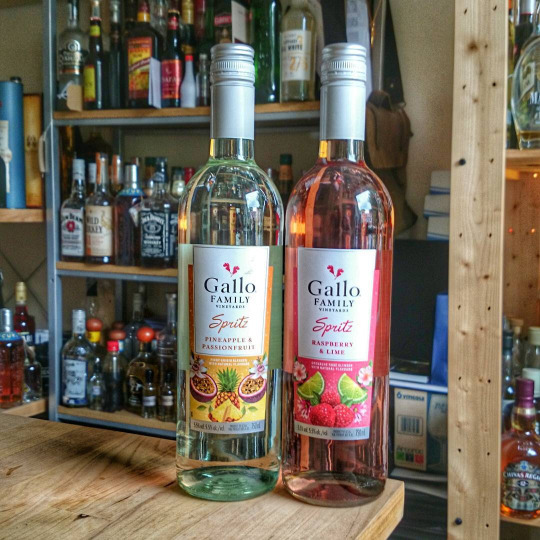 Gallo Pinot Grigio gently spritzed and blended with natural flavours of pineapple and passionfruit. A soft nose of the well-balanced pineapple and passionfruit, with a natural sweetness and fresh grape aroma coming through. Light on the palate, with a slight burst of the fresh passionfruit, followed by the soft pineapple base. Bursts of the fresh Pinot Grigio comes through on the lingering finish. Gallo Grenache Rosé gently spritzed and blended with natural flavours of raspberry and lime. Light notes of the raspberry and lime on the nose, with a fresh zest and soft sweetness following. The raspberry dominates a fresh and crisp palate, with the lime following to soften the dryness on the long, aromatic finish. As you may have guessed, these are not your usual expressions when talking about wine, but the inspiration for me to look into E&J Gallo came from the introduction of the Spritz range this year (2015), itself inspired by the sun-drenched fruits of California. The Spritz expressions are said to be “perfect for those who like the idea of wine, but love fruity tastes and want something more informal”. The best way to enjoy is to serve each chilled or over ice. Of course the more traditional expressions are available, including the base of the pineapple and passionfruit Spritz in the Pinot Grigio, as well as Chardonnay and Moscato, a Whtie Grenache and White Zinfandel if you prefer your rosé styles, and of course Cabernet Sauvignon, Merlot and Pinot Noir amongst the expressions of red available. The Spritz though are a great change to your normal sparkling choices, and well worth a try before the Summer turns to Winter! Previous PostPrevious He’s Coming . . . . . .